Full kit is everything you need to handle any camera. 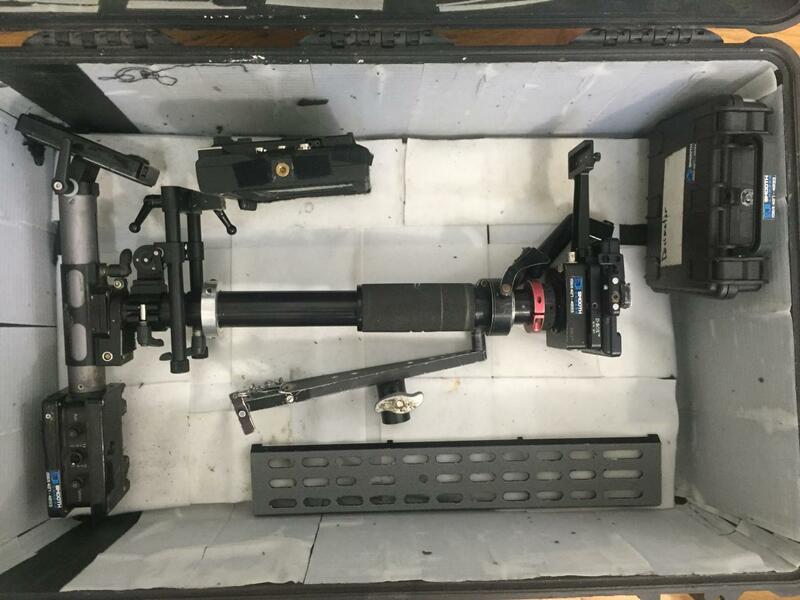 The entire kit fits into one Pelican 1650 as well. Fully re-furbished by Robert Luna in 2014. Been my main arm for 3 years. Has been modified so socket block can rest at hips. Also added Kip handle to adjust the hight of bridge plate and socket block. (can be switched to either side of the vest as well) Also added is a safety bolt so the socket block never falls off the spar. Pro Sled upgraded for heavy cameras. This sled is SD but I have been told it can be upgraded to HD. I am including a decimator down converter so that HD signals can be converted to Sd so they may go through sled. Decimator can be quick attached to t-bracket with attachment. The gimbal is upside-down which is so in quick low mode the gimbal won’t hit the camera. - The Donkey Box 2 t-bracket was upgraded to the DB3 to avoid vibrations. - Ad on Modified 3rd adjustable AB battery Plate. - Pelican 1650 with wheels and a little foam (w/ 3 zipper pouches, Dovetail holder and Allen t-handle holders. Pelican inside is covered in hard velcro for separators. - Pouch of replacement screws and such. And pix of arm and vest that you can post?